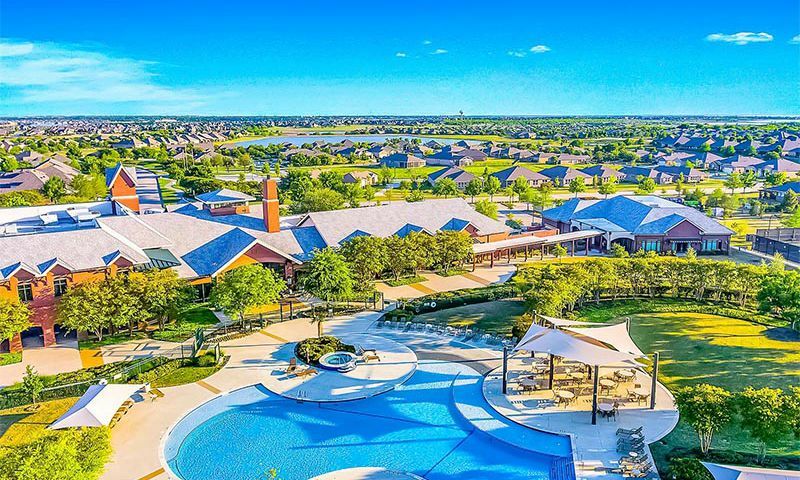 Del Webb's Frisco Lakes is wrapped around the shores of beautiful Lake Lewisville in prestigious Frisco, Texas. This highly desirable destination 30 miles north of Dallas offers the ideal blend of culture, recreation and lifestyle. Frisco Lakes features two clubhouses, an 18-hole golf course and other world-class amenities. Frisco, Texas has blossomed into a rapidly growing upscale suburb of the Dallas-Fort Worth metroplex. It has been designated one of the fastest growing cities in the country due to an attractive setting that is rich in culture and history. A favorable climate and low cost of living makes it ideal for active adults and retirees. As a result, nearly half of this community's residents have flocked to the community from other states around the country. The proximity to Dallas and Fort Worth also makes it a desirable community for people who continue to work. At the heart of this 55+ community is the magnificent 28,000 square-foot Village Center and Sports Complex. It features a myriad of desirable amenities geared towards active adults. The clubhouse includes a state-of-the-art fitness center with the latest cardiovascular and weight training equipment. The workout room is surrounded by an indoor walking track and an aerobics and dance studio. There is also a large ballroom, arts and crafts studios, card rooms, a library and learning center, a computer lab and billiards hall. The Village Center also boasts an indoor lap pool and spa. Sports enthusiasts enjoy the outdoor resort-style pool and spas, four tennis courts, four bocce ball courts and miles of walking and biking trails. A community fitness instructor is continually providing an array of exciting fitness classes and events such as water aerobics, line dancing, tennis and golf tournaments and much more. In addition, there is a new amenity center that recently opened and will provide additional amenities for residents. Inside the facility there is a fitness center, card rooms and hobby and game rooms. Outside, residents will be able to enjoy pickleball courts, horseshoe pits and an outdoor pool and patio. Golfers will relish the magnificent 18-hole Frisco Lakes Golf Club. The 7,099-yard par-72 course was designed by noted golf course architects at Gary Stephenson Golf Design. The course winds throughout the community and showcases a few holes tucked along the shores of Lake Lewisville. It boasts generous landing areas and rolling greens that are sure to provide a fun and challenging golf experience for golfers of all skill levels. Residents enjoy discounted green fees and preferred tee times. There are several single-family floor plans available in this community. An ever-changing assortment of Del Webb's previously built models are available on the resale real estate market in Frisco Lakes. A variety of styles and reasonably priced homes makes this 55+ community attractive and affordable for almost any active adult buyer. Many of the homes offer scenic views of green belts, the golf course or Lake Lewisville. Del Webb began construction in 2006 and upon completion it will contain nearly 3,000 homes. Homes typically feature two to four bedrooms, two to three bathrooms, and a two to three-car garage. True to Del Webb's style, the homes in this community are uniquely designed with the needs of active adults in mind. Expansive great rooms, gourmet kitchens and ample outdoor living space are characteristic of many of the homes in this active adult community. A special emphasis has been placed on designing homes that require minimal maintenance, which allows residents more time to enjoy the amenities and lifestyle. An activities director is continually supplying the residents of the community with an ever-changing lineup of fun activities, events and classes. Whether your passions include wine tasting, cards, arts and crafts, golf or history discussions, there is something for everyone. There are several dozen clubs and interest groups that cater to the socially active and fitness minded residents in the community. Residents looking to pick up a new hobby can join the camera club or the theater club. Those looking to get into shape can join all kinds of activities from zumba to cardio combo to meditation. A community calendar and newsletter alerts the residents of the many options available to them each week at Del Webb Frisco Lakes, Texas. This 55+ community is located in beautiful Denton County, Texas. Within 10 minutes of Frisco Lakes, there are countless shopping outlets, big name retail stores and fine dining establishments. A variety of minor league sports teams have venues in the surrounding area including the Dr. Pepper Ballpark and Arena, which host Major League Soccer, Indoor Football League and AA Baseball. Plus, nearby Dallas and Fort Worth are accessible in under an hour where a world of fun, entertainment and shopping await. The city is home to Stonebriar Centre Mall, the largest mall in North Texas. Other popular attractions in the area include the Frisco Chorale, Frisco Community Theatre, Frisco Association for the Arts, Texas Sculpture Garden, Dallas Museum of Art and Bass Performance Hall. Closer to home, residents have access to an abundance of recreational opportunities such as Lake Lewisville. Del Webb enjoys waterfront views of the lake, which is ideal for recreational boating, fishing, skiing and personal watercraft. The reservoir contains over 183 miles of shoreline that include many recreational beaches and marinas. Hidden Cove Marina is just one mile from the community and provides a great place for weekend picnics, boat rental and boat storage. Frisch Lakes is the ideal 55+ community for those looking to make the most out of all that Texas has to offer. The Village Center is the focal point at Frisco Lakes. Here residents can stay both socially and physically active. Village Center - 28,000 Sq. Ft. The Golf Center is a 10,000 square-foot facility that has everything needs for the perfect golf experience. Below is a list of outdoor amenities found within Frisco Lakes. There is a new amenity center that recently opened and provides additional amenities to keep residents active. There are plenty of activities available in Frisco Lakes. Here is a sample of some of the clubs, activities and classes offered here. Red Hat's Society's "Ladies of the Lake"
The Traditional Series homes were introduced in 2008. They include seven models that range from 1,137 to 1,532 square feet. Homes in this series feature two bedrooms, two bathrooms and an attached two-car garage. The Club Series homes were built between 2006 and 2008. These models are now available on a resale-only basis. The two floor plans in this series offer two bedrooms, two bathrooms and a two-car garage. The Signature Series includes nine single-family floor plans. Homes in this series range in size from 1,649 to 2,094 square feet and feature two or three bedrooms, two bathrooms, and a two or two-and-a-half-car garage. The Garden Series features three single-family floor plans available on a resale-only basis. These floor plans offer two or three bedrooms, two bathrooms and a two-car garage. The Signature Series homes were introduced in 2008. This collection includes four floor plans that range from 1,703 to 1,977 square feet. This series features plans that offer two to three bedrooms, two bathrooms, and a two or two-and-a-half-car garage. Most homes also have a den. The Estate Series homes began in 2006 and are now available on a resale-only basis. These homes feature two to four bedrooms, two to three bathrooms and a two to three-car garage. The Premier Series homes were introduced in 2008. These models are available in four choices that range from 2,213 to 2,681 square feet. Homes in this series feature two to three bedrooms, two to three-and-a-half bathrooms and a two to three-car garage. Most homes also feature a den. We have mixed feelings about living in Frisco Lakes. The current Board of Directors is basically an extension of Pulte management and the two current homeowner board members do not adequately represent the homeowners so it's pretty much "what Pulte wants Pulte gets". Also Pulte does very poorly in the customer service area when it comes to living up to home warranties. On the positive side we have met some very nice people here at Frisco Lakes and there is more than enough going on to keep is busy. The community is also very well maintained although it sometime takes Pulte longer than it should to correct problems. We lived in Dallas for 24 years where my husband was "the tax man". We finally decided to downsize and after coming out to see Frisco Lakes we quickly knew it was the perfect place for retirement. It's still relatively close to Dallas and all our friends there. The clubhouse is fantastic, we love the gym and the pool, the indoor track, golf, tennis, trails ... the list goes on. We use nearly everything here and we try to get involved as much as possible with different clubs and volunteering in the community itself or the local Frisco area. It keeps us busy and gives us a great feeling of fulfillment. 55places.com is not affiliated with the developer(s) or homeowners association of Frisco Lakes. The information you submit is distributed to a 55places.com Partner Agent, who is a licensed real estate agent. The information regarding Frisco Lakes has not been verified or approved by the developer or homeowners association. Please verify all information prior to purchasing. 55places.com is not responsible for any errors regarding the information displayed on this website.